A special shrink wrap covering (shown in front) is being developed by Changfeng Ge, assistant professor of packaging science, to provide an alternative to using colored glass bottles. Ge and several students are researching alternative coatings for PET bottles that would protect the beverage from light, oxygenation and moisture, all qualities that diminish the flavor and quality. From fraternity parties to presidential conversations, beer has its share of connoisseurs. Light or dark, lite or full-bodied, beer is at its best brewed, bottled and bold. Sustainable packaging has gained momentum, even in the beer industry. In the last several years, companies as old as Carlton & United Breweries in Great Britain and Miller Brewing in the United States began using plastic, or PET, bottles for their beers, making a significant change from the longstanding tradition of using green, amber or clear glass bottles. In today’s marketplace, the push for more cost effective glass recycling processes and better use of biodegradable materials has found its way into breweries and recycling plants. Research focuses on improving the PET bottles, determining the optimal conditions that would make beer in a PET bottle as flavorful as a brew in a glass bottle, and improving the recycling process. Some of the research into enhancing the properties of the PET bottles is being conducted at RIT by Changfeng Ge, assistant professor of packaging science in the College of Applied Science and Technology. Ge along with packaging science students James Gross, Jeffrey Spiwak and Benjamin Brooks recently completed one of several phases of their research, “Adding a High Barrier Shrink Film to a Beer Bottle: An Alternative Way to Enhance the Barrier Properties of a PET Bottle.” They found that plastic shrink film can protect as well as glass against the three most damaging properties to beers—light, oxygenation and moisture. Bottles with brown or amber glass protect beers from light that can breakdown its properties making it bitter rather than hearty. Green or colorless glass offers less protection from light. Recycling bottles that are amber or green require higher firing temperatures than a plain glass bottle, expending more energy and costing more, in the process, Ge explains. Ge and the students propose a new method to apply a barrier shrink film around a plain PET bottle. They tested the rate at which oxygen molecules pass through the beer bottle with the new film sleeve. Tests were conducted with different strength wraps, polyvinylidene, also referred to as PVDC, and used in Saran Wrap, and ethylene vinyl alcohol, or EVOH, a barrier film best suited for cold storage temperatures. The students studied the varying temperatures and humidity rates at which the films or wraps would retain their protective qualities, sometimes using temperatures up to 162 degrees Celsius. They focused specifically on the absorption of oxygen into the wall of the bottle and found that the wrap decreased oxygen transfer into the PET bottle and could act as an efficient barrier protecting the contents, says Gross. They will continue testing, adding more quantitative results to the growing success rates of using PET bottles with film coverings. 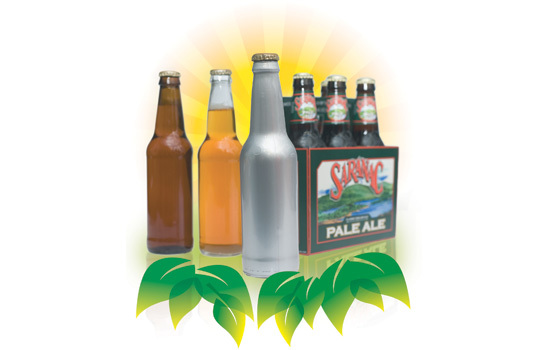 The alternative coating is also easily added into the bottling process and absorbs inks for the beer label, an important factor in retaining brand identity. It also can be easily removed and is less costly in the recycling process than using one of the darker colored bottles, Brooks adds. Beer brewing remains a process specific to the company; beer drinkers know the difference between a Budweiser and a Dos Equis. Bottling is essential in retaining the unique flavor of the brew, so die-hard beer drinkers may have a difficult time believing that a brew in PET bottles is as authentic as beer in amber bottles. The experience might look different, but the truth is in the taste—and if plastic can contain the robustness of a Guinness, sustainability provides it with a satisfying finish. Recycling one glass bottle saves enough energy to power a 60-watt bulb for four hours, a computer for 30 minutes or a television for 20 minutes.